Martin Entz collects heads of perennial rye at Carman, July 2009. Currently, possibilities for increasing perenniality in cropping systems are limited by the types of perennial crops available for farmers. For example, there is only so much alfalfa hay needed on any one farm or in a region. Also, perennial forages have a limited "shelf-life". If the perennial crops could be grown for grain instead of only herbage, increasing perennial crop production would be much more feasible. The current world leader in perennial grain crop breeding is the Land Institute located in Kansas. Visit the Land Institute website to learn about breeding progress for crops such as perennial wheat, sunflower, sorghum, intermediate wheatgrass, and Illinois bundleflower (www.landinstitute.org). Canadian researchers at the Agriculture and AgriFood Canada research centre at Lethbridge have been developing perennial rye grain crops. Perennial cereal rye, July, 2010. 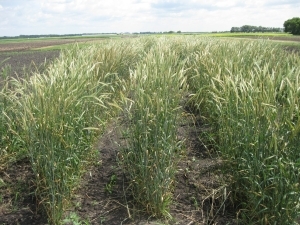 In fall 2007, we planted our first perennial grain crop - perennial cereal rye developed at AAFC Lethbridge - at the University of Manitoba Research Farm at Carman, Manitoba. By the summer of 2009, the rye had survived two winters and was allowed to produce seed. Seed was harvested from selected plants and planted in fall 2009 to allow for further selection work. We have also begun work together with the Land Institute on perennial wheat. Five strains of perennial wheat were planted at various locations in Manitoba in fall 2008. Winter survival was variable, but many plants did survive the winter and produced seed in 2009. A few of these plants exhibited fall regrowth after producing seed, a sign that these plants are behaving as perennials and not just winter annuals. In summer 2010, we had two perennial wheat plants regrow and produce seed. 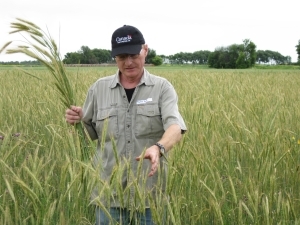 In fall 2010, the University of Manitoba Department of Plant Science hired a perennial grain breeder who is now carrying on the work we began.